Throughout much of The Islands and the Whales the rugged Faroe archipelago, jutting out of the sea with awe-inspiring majesty, is shrouded in low-hanging cloud and grey mist. A film that is jaw- dropping in its visual splendour, the choice to envelope the islands in this blanket of precipitation is a keen move by Scottish director Mike Day as it closes off the outside world, further isolating an already remote nation – located mid-way between the Hebrides and Iceland. Essentially a one-man storytelling band, Day also produced and shot this project himself and it is behind the veiled curtain, and under the skin, of the Faroese people that he takes a viewer. His marked impartiality, and cautious distance, from the issues of whale hunting, environmental pollution and the threat of globalisation permits a large degree of personal investment and assessment. Though Day may remain silent behind his camera, an omnipotent narrative voice lends The Islands and the Whales a folkloric, ethereal quality that alludes to the importance of legend and tradition for the Faroese people who for 1000 years, since the time of the Vikings, have “relied on the seas for its livelihood.” For all islanders, the Huldofolk – mythical spirit-like creatures who are believed in without being seen, harbingers of doom or bringers of good fortune – are known to have respected the symbiosis between man and nature, a fine balance which modernity and the impact of the world at large has knocked off-kilter. Moving in and out of everyday routine, the hunting of pilot whales and capture of sea birds for sustenance is presented with unflinching, unfiltered horror and – from an outsider’s point of view – disquieting normality. It will prove tough viewing for even the most strong stomached viewer. As a flotilla of fishing boats corral whales into a narrow bay, men and boys wait on the beach sharpening knives and spears, clenching fists and gritting teeth as if preparing for battle. Stabbed through their blowhole, the carcasses are skinned and hacked into manageable pieces for consumption. 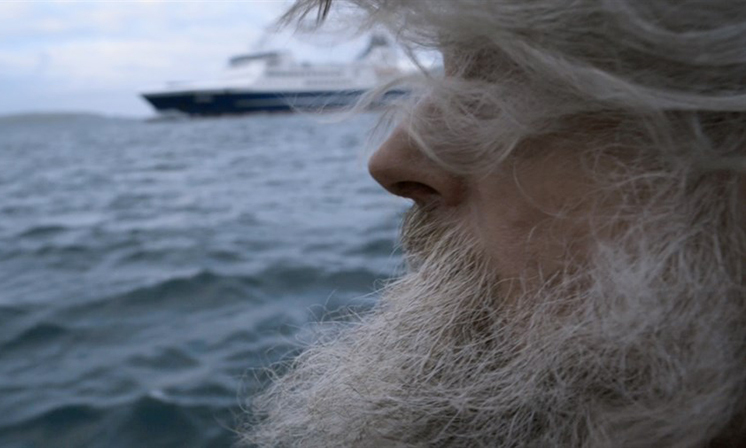 The Sea Shepherds – a marine conservation group with none other than Pamela Anderson in tow – attempt a blockade, but this is the only outside intervention of a very insular film. Studies showing that rising mercury levels in all manner of sea animals due to pollution further afield lead to warnings from the health minister which by and large fall on deaf ears. That there is no line of clear argumentation here is a bit of a two-edged sword. Initial intrigue lies in simply taking in a presentation of an unfamiliar and interesting way of life; however, as we become more comfortable the methodical pacing and lack of forward motion becomes a little frustrating. This is, however, due in no small part to the islanders’ resistance to change. In allowing the natives to speak for themselves, brutally depicting certain elements of island life, and shining a spotlight on a singular community, Day has carved out a brave, revealing and morally uneasy expose of a largely unknown nation. Heed scientific advice and change hundreds of years of cultural identity or risk slowly poisoning your children? It is a quandary that The Islands and the Whales does not attempt to resolve, but one that the Faroese people can no longer ignore.